By pressing the turn indicator lever several on-board computer information can be displayed. Which kind of information will be displayed and in what order can be programmed. 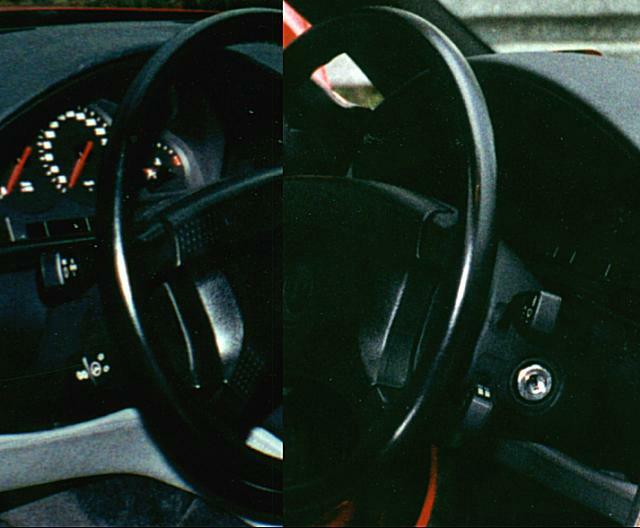 The steering wheel can be adjusted in four directions (up/down, in/out) which can be simulated by the adjusting lever movements. The wipers are partly concealed behind the rear edge of the engine compartment lid. The length of the interval is varied automatically according to the car's actual road speed. However, the driver can also vary the wipe intervals by moving the lever briefly from parked position to intermittent and back again. The time which elapses before switching to intermittent again is the subsequent intermittent wipe interval (maximum 25 seconds). The interval setting is cancelled if the lever is returned to parked position or when to ignition is switched off. If the car comes to a standstill, the wipers are reset to intermittent operation until the car restarts. If the car comes to a standstill, the wipers are reset to the normal speed until the car restarts. Moving the lever down briefly is followed by brief wiping. Fluid from the washer tanks is sprayed on the windscreen and the wipers operate briefly. When the lever is pulled briefly, washer fluid is sprayed on the windscreen without the wipers being operated. If the lever is pressed in the direction of the steering wheel automatic windscreen washing is activated, but intensive cleaning fluid is first sprayed on to the windscreen. If the pop-up headlights are extended, they are automatically cleaned as well on each fifth occasion the windscreen is cleaned normally or intensively. In ignition key position 2 the windscreen washer jets are heated automatically. Any desired road speed above approximately 40 kph can be memorized and maintained automatically. The memorized speed value is lost when the engine is switched off. Moving the lever briefly to the front: The car's actual speed is maintained and memorized. Each time the lever is moved briefly to this position again, road speed is increased by approximately 1 kph. Holding the lever in this position: The car accelerates without the accelerator pedal being touched. When the lever is released, the speed then reached is maintained and memorized. Moving the lever briefly to the back: The car's actual speed is maintained and memorized. Each time the lever is moved briefly to this position again, road speed is reduced by approximately 1 kph. Holding the lever in this position: The car decelerates without the accelerator pedal being touched. When the lever is released, the speed then reached is maintained and memorized. Pushing the lever into the direction of the steering wheel will recall the speed last memorized and the car will maintain it once it has been reached again. Moving the lever briefly up or down switches the cruise control facility off, regardless of the actual road or traffic situation.